We didn’t notice anything strange about the neighbor’s house until we had already parked in our own driveway. We noticed the small things first, like the white vans, instead of the gutted home. When we finally did notice, my husband and I stood in the driveway for a spell, trying to piece together meaning from the clues. Old man Jones, who lives across the street, and his granddaughter, Anna, who lives around the corner, walked over our driveway to relieve us of wondering. “I just was sitting in my house and then I heard a big PFOOF!” said Jones, eyes wide, hands gesturing in complementary arcs. His large-framed glasses surrounded those wide, popped eyes. Gasoline, my husband explained to me later. Gasoline is the only thing that makes a BIG PFOOF. Jones told us that after the BIG PFOOF , Jones saw a man kicking burning leaves away from our house. Additionally, our hose, which had been disconnected for the winter, had been plugged in and pulled toward the side of our house which had faced the fire. Was the arsonist trying to control the flames? Was this some kind of attempt to diminish the wider-reaching effects of a personal attack? Whatever reason the flame-crazed man had for sparing our property, we were thankful. “They’re all part of a crime ring” said our neighbor, Anna, who gestured to three shambling houses adjacent to my own. She was pale with brown eyes and hair. “They all know each other.” She crossed her arms again, protectively. Now a middle-aged blonde walked jauntily to our semicircle, giving the wrecked home a bemused once-over. “What happened?” asked the blonde, who also happened to be my neighbor. The elevated volume of her voice caused me to wince, just slightly.This was the first time I had heard her speak, even after living in my home for over a year. Her accent was southern and thick–a surprise, really. After briefly implying her disdain for the low-lifes of the neighborhood–if she’s lucky, they will be forced to move away–she engaged old man Jones in small talk about the new dog in his family. A bleeding heart, that one. I hugged myself as if to shield myself from the strangeness as much as from the cold. Our silent neighbors, speaking. Our one-solid, fence now sported a gaping hole with black-tinged edges. One of the white vans had tore through the earth, razing our yard and marking it with scars. A man was hoisted up from the white van next to our house, fiddling with the electrical lines which hung over the burned leaves. We all wondered the same thing about the people whose home had burned down, a man and his two sons. What would they do now? “Do you need blankets? Or food?” I asked the men, who I had never liked, surprising myself. The man whose house had just burned down stared at me, confused, so that I had to repeat myself. “No, not right now” he said. Being absolved of duty, my husband and I took our leave of the people who assembled around the burned home and excused ourselves inside “to make dinner.” Ten minutes later, after fussing over the dog again, we went out and bought dinner instead. We came home and alternated between giving thanks for our good fortune and grumbling about our luck and our crap hole of a neighborhood. 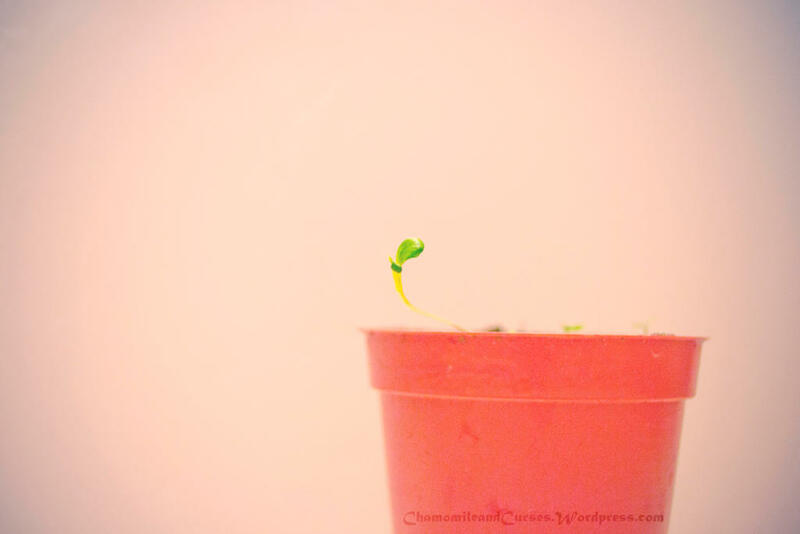 Still, there was a small pot of germinating plants on my windowsill. Gentle sprouts shooting up from the dark earth. Fire had not touched even the smallest living thing in my home, and for that I was grateful. Growth and love and warmth, all saved from the fires which had burned just a few feet away. My husband and I held each other tightly before we went to sleep. I can’t remember if I felt blessed or burdened when I fell asleep, because my mind was changing as rapidly as an actress in a live theatre production who changes her costume between each act. How will I see this situation? Should I be afraid to live where crimes are a daily occurrence? I’ll leave you with the hopeful image of my plants, who grow toward the light and bend away from the shadows. I’ll leave you with the comfort that not even the smallest and most defenseless plant in my home was touched by the fire. And maybe by leaving this image with you, I can believe it as well. Note: The names in this account have been changed to protect the privacy of people involved.